Photo by Adam Crowther Phtography. Sheree Halliday—on caring for kids, competing, and being voted a boxing babe. Sheree Halliday has two sides: nurturing nanny and tough Muay Thai fighter. Although her Muay Thai fighting side has been away from the ring for over a year, she is about to step back into the limelight when Sheree (representing Keddle’s Gym, UK) takes on Elna Nilsson (Real Fighter, Sweden) in an A class bout in London, UK on 20th October. 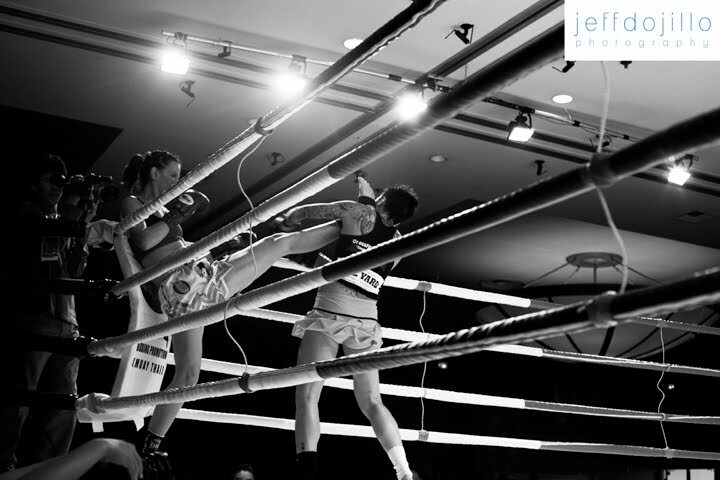 During this (my first) interview for Muay Thai on the Brain, I asked Sheree a few questions on her busy life as nanny, Muay Thai fighter and teacher, her plans for the future, and what her employers think about her out of work activities. At what age did you start training in Muay Thai and what prompted you to first try it out? I’d just turned 19 when I first started training. I’d previously gone to watch a friend’s brother in a kickboxing competition and secretly thought I’d love to give it a go but didn’t think I’d be able to. Coordination wasn’t my thing! My younger brother was learning karate at a local leisure centre. I used to take him and noticed on the timetable they had Thai boxing as well—I had no idea what it was! For about a month, whilst my brother was doing karate, I’d watch through the sports hall door thinking I’d love to give it a go. I managed to persuade a friend to join me—she lasted about a month! You used to compete in athletics as a teenager. Which events? Do you think your athletics background has helped your Muay Thai career? I’ve always been very sporty—competing for all my school teams in netball, basketball, cross country and athletics. I was also a member of Woking Athletics Club and competed in the 600m, 800m, and cross country events. I was U13 Surrey champion for 600m. Athletics has definitely benefited both my Muay Thai training and fighting. Having been competitive from an early age I learned how dedicated you need to be to succeed in a sport—the more dedicated you become the more you want to succeed. It gave me an understanding of health and fitness and also how to deal with nerves before an event. How many fights have you had altogether and what titles have you won? I’ve had 26 professional fights (17W, 8L, 1D, 5KO’s) plus 4 amateur fights. I won IKF European (60 kg), WPKL British (61.5 kg), and ISKA English titles, and also won a bronze medal at the IFMA World Championships in 2006. What would you say is your greatest achievement in Muay Thai? This is a really hard one. I feel my whole fighting career has been an achievement. I’ve have all around the world, won titles, represented my country at the amateurs—it’s been amazing! If I had to choose one maybe it would be winning my WPKL British title against Bonny Van Oortmerson. I’d spent 5 months in Thailand—that was my first fight when I came back and one of my best performances to date. In July 2010, Sheree (left) fought Roxy “Balboa” Richardson in a WMC bout in LA, USA. Photo by Jeff Dojillo Photography. What was the toughest fight you had? I think I’d have to say my fight against Roxy “Balboa” Richardson in LA, USA. She’s a tough girl. The fight was A class but with only 1 minute’s rest between rounds. It was non-stop from the first bell. It sounds like Roxy would agree it was a tough fight. She is quoted as saying that your fight with her was “an all out war from bell to bell for all five rounds”. This is the first time I’ve heard this! It’s put a big smile on my face. It was a tough fight! You lost that bout on a split decision but there was some controversy over the result. How do you feel knowing that Roxy has retired and you will never get that rematch you wanted so badly? In my opinion (and the opinions of many others) I won the fight. I was so gutted when the decision was announced. I put everything into that fight—the best I’ve ever fought. A rematch was asked for but I was told it was refused. Knowing now that Roxy has retired I’m a bit gutted I won’t get chance to settle the score. Sheree was voted Best Looking Female Fighter in Muay Thai Online’s 2007 British Muay Thai Awards. Photo for MSA. Do you find it hard juggling your job as a nanny with fight training? What does the family you work for think about you fighting? It is really hard trying to juggle work and training for a professional fight. It’s hard enough training full-time let alone having to work as well. Up for early morning runs, long day at work, and then late training sessions take their toll. Some people think nannying is an easy job—it may be physically but mentally and emotionally it can be so tiring, especially looking after 2-year-old twin boys. I am very lucky and work for a lovely family who are always flexible if I need to take a holiday for fights. I think they think I am slightly mad doing the sport I have chosen, especially the whole cutting weight thing! You trained for some time in Thailand. How long did you spend there in total and which gyms did you train at? I had two stints in Thailand—one lasted for 5 months and the other 6 months. I trained at Siam No. 1 in Chiang Mai but only for a short time—about 2 weeks. Then it was off to Bangkok, where I found my second home—WPT Gym. What did you like best about training in Thailand? Was there anything you didn’t like or any bad experiences? The great thing about training in Thailand at WPT was training with Pimu. The first time I went it was like starting a new sport. Learning foot work, positioning, timing…..everything was broken down step by step. I loved the intensity of the training, the heat, the people, and the culture. The only thing I would say I didn’t like was training with injury. If you stop you’re considered lazy or weak, so you develop the fighters’ mentality of train through it! 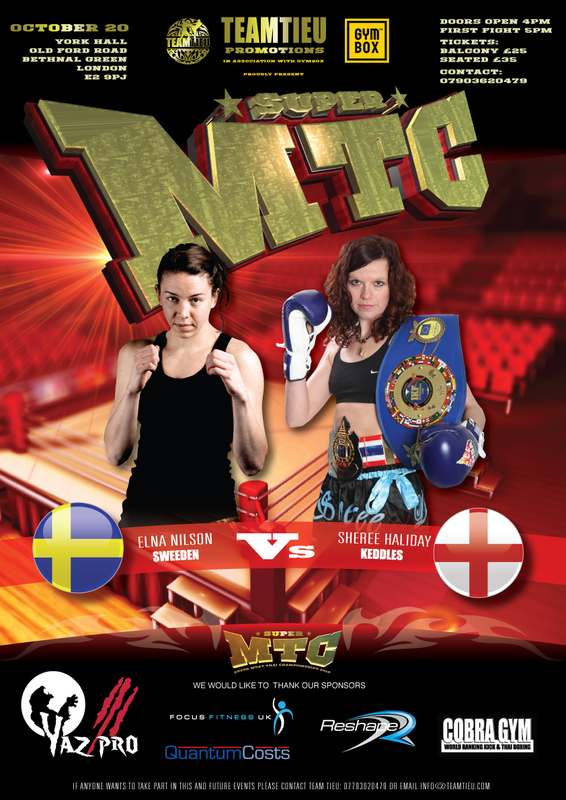 Poster for the Super MTC promotion on 20th October, York Hall, Bethnal Green, London, UK. Your fight on 20th October will be your first in over a year. Why did you take so much time out? I know—a whole year out. Mainly due to an untreated injury from my trip to Thailand in 2011. What do you know about your opponent (Elna Nilsson)? I’ve been told she is a Swedish champion and that we have similar fight records. I haven’t done too much research on her—sometimes I prefer not knowing. Some of her fights are on YouTube. She seems to have a nice Thai style and has trained at Sinbi Muay Thai in Phuket. Are you still teaching a women’s class? Would you like to have your own gym/fighters in the future? At present I’m not teaching the women’s class due to a few problems with the studio. I would love to start teaching again, but it’s difficult to find time with working and training at the moment. I had great feedback from the previous classes so need to get started again soon. My own gym and fighters would be amazing—so would winning the lottery! Maybe one day when my fighting career comes to a stop I would love the opportunity to pass on my knowledge. According to my dad I’m getting a bit too old for this anyway! What’s next for Sheree Halliday? Who knows?! I’ve been asked to fight in London in December, but it hasn’t been confirmed yet. I would love to visit Thailand again soon—I miss the land of smiles. I would also love the opportunity to fight for a world title, and to fight on one of the big shows in Thailand—King or Queen’s Birthday—it would be amazing. More teaching would also be on my list of to do’s! With beauty and brawn in equal measure, positivity and charisma, Sheree Halliday is a great representative for women’s Muay Thai. Please show your support for her return to the ring on 20th October. And watch out for more of Sheree in the future—expect more good things to come from this boxing nanny. I’m not sure I agree with your statement that women fighters need to qualify as attractive in some way to be successful in Muay Thai. I think to be taken seriously in the sport you often have to play down your femininity—certainly in the gym and maybe more so in Thailand than in the West because we are required to be more modest here. If women fighters, such as Sheree and Julie Kitchen for example, can be successful in the ring without sacrificing any of their femininity I think it’s commendable. In 2006 I was involved in a “Miss Muay Thai” tournament at Sanam Luang, which was basically like a beauty pageant—we were judged on our fight, our wai kru, and also our “talent”. I felt quite uncomfortable with whole concept, especially the section where we had to showcase our “talent”. My talent of having a PhD went down like a damp squid! But I don’t sing or dance so that was all I could offer! Thanks for your answer Melissa. Very interesting. In Thailand we’ve noticed that “Tom” (masculine) in appearance Thai female fighters are snickered at quietly by other Thais (males by also females) at fights, when in contrast, for instance, Miss Universe in Muay Boran costume was proudly posted in a larger than lifesize photograph at the entrance of Lumpini Stadium. 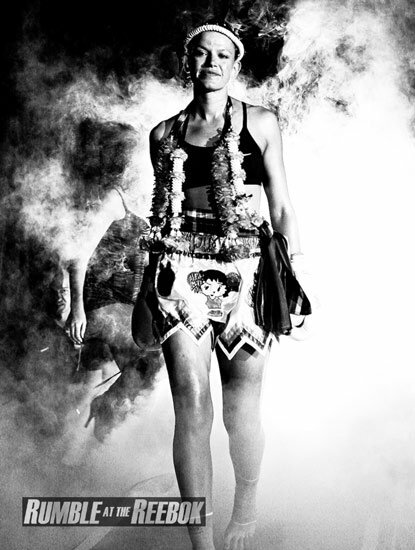 It is hard to figure out the full Thai female fighter aesthetic code, bit from what we have read academically and experienced anecdotally there does seem a bias towards and image of a “feminine” female fighter at least to some degree. And while I agree that women have to continually and sometimes relentlessly downplay their femininity in gym environments for a large number of reasons, East and West. I’m speaking of depictions of female fighters. Strictly speaking I did not say that they need to qualify as attractive to “be successful”, rather that there seems a bias towards the “pretty but deadly” image of the female Muay Thai fighter, at least in media and sometimes in community – a fairly well-known profession female fighter lost to a prominent female fighter on a close decision and was told rather chauvinistically after the bout, on the side, by a sanctioning official something like “What do you expect when you get in the ring with a beautiful woman” (paraphrased). While of course I do believe that women can be successful in all sorts of ways without being labeled “attractive” it would seem wrong to deny that at least in the depiction of female fighters there is a well-received stereotype. It goes in line with larger Western pop images such as female Superheroes to Kung Fu movie and video game heroines. All we have to do is look at the meteoric rise of Gina Carano, or other Master Toddy prodigies and realize that there is money or at least recognition to be made with the marriage of “pretty” and “tough”. I’m not saying any of this is right or wrong, it strikes me as complicated, but every time I see female Muay Thai fighters posed or described in ways males aren’t it raises the thought again, without judgement. That story of the Miss Muay Thai tournament is just amazing. What an experience! In Thailand we are still trying to figure out just how the female fighter (and the farang female fighter at that) is perceived by Thais. I’m amazed at how embraced Sylvie is by Thais in the city when they find out she fights, a very non-Western and almost universal response, but then there is so much unsaid in Thai culture, and the line between masculine and feminine is different than in the West. Just noticed my own typos…..I meant “damp squib” not “damp squid” haha! Thanks for your comments and I agree the line between masculine and feminine is quite different in Thailand than in the West. I think Sylvie recently made some comments on the subject in one of her posts? Update: During the fight on October 20th, Sheree cut Elna and won by TKO in round 4.